Unless you make all your purchases online, you'll probably have to interact with a salesperson at one time or another this holiday season. Although most salespeople don’t try to intimidate or manipulate you into buying items you neither need nor want, it helps to know how to handle the ones that do. Whether you’re shopping for a car, gym membership, or toaster, here are eight tips for dealing with aggressive salespeople. 1. DISTINGUISH BETWEEN ASSERTIVE AND AGGRESSIVE. There can be a fine line between being assertive and aggressive, and it's up to you to distinguish between a salesperson who’s annoyingly overeager and one who will say anything to make a sale. 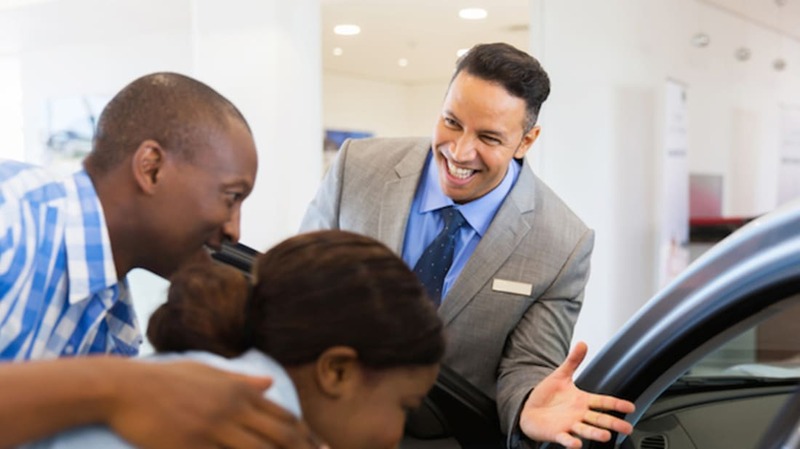 If you’re waffling on whether to make a purchase, an assertive salesperson may provide more information or respectfully ask you what he can do to help you make your decision. An aggressive salesperson, on the other hand, may threaten to revoke a discounted price, complain that your indecision is wasting his time, or refuse to accept that you don’t want to make a purchase. 2. BE MINDFUL OF YOUR EMOTIONS. Good salespeople are skilled at reading customers’ emotions and examining their body language to determine if they’re going to buy an item. But aggressive salespeople can use this skill to manipulate customers into buying something they don’t really want. Depending on the product they’re trying to sell, salespeople for insurance plans or gym memberships may try to persuade you by capitalizing on your fears about death, money, health, or vanity. When you’re speaking with a salesperson, pay close attention to your emotions and listen to your gut. Watch out for salespeople who sound phony when they make small talk, reveal too much personal information (to try to become your friend), or make you feel guilty about not buying a product. 3. PRESENT A UNITED FRONT. If you’re shopping for big-ticket items such as a car, boat, or house, salespeople may try to pit you and your spouse against each other. Beware of salespeople who try to physically separate you from your spouse, coax you to agree to a higher price than your partner, or appeal to your spouse’s sense of manhood or womanhood. Before you go shopping with your partner, decide on your budget, buying strategy, and any non-negotiables. 4. DON’T FALL FOR ARTIFICIAL DEADLINES. To try to close a deal, aggressive salespeople often put time pressure on a customer. By giving customers made-up deadlines, salespeople exploit impulse buyers and appeal to customers’ fear of missing out on a good deal. To be sure, some stores run legitimate limited-time sales that put true deadlines on customers. Generally, though, if a salesperson tells you that you must buy an item now, and says that you’re not allowed to take time to think about it or do more research, consider that a red flag. 5. REGISTER YOUR PHONE NUMBERS ON THE DO NOT CALL REGISTRY. Some salespeople (and scammers) make cold calls, hoping that someone they talk to will buy their product. Register your home and cell phone numbers on the National Do Not Call Registry to stop receiving telemarketing calls. But keep in mind that some telemarketers will still call phone numbers listed on the registry, so file a complaint or block their numbers. If a salesperson somehow gets you on the phone, politely tell her that you’re not interested and you want to be removed from her call list. Don’t feel guilty about cutting her off, not answering her questions, or hanging up. 6. BE MINDFUL OF COMMISSIONS. 7. DON’T BE AFRAID TO REPEAT YOURSELF. Pushy salespeople know that their persistence can wear you down and break your resolve. If you don’t want to buy something or need more time to think, be firm—and use unequivocal terms like "I don't" or "I won't" rather than "I can't." Politely tell the salesperson that you’re not going to make a purchase, and repeat yourself if they keep pushing. Most “people pleasers” will find it challenging to hold their ground, but remember that your first priority is to yourself, not the salesperson. Aggressive salespeople are simply trying to do their job to the best of their ability, so don’t take it personally if you encounter a rude or forceful one. Even if a salesperson annoys or frustrates you, try to be polite and calm. Be firm if you’re not interested in what they’re selling, and ask to speak to a different salesperson or leave the store, if necessary.